The historic buildings which have been reconditioned and a fish drying flake used at the cod fishery on Battle Harbour in Southern Labrador dating back to 1770. Fog has settled in around Battle Harbour on Battle Island in Southern Labrador making things hard to see from the water but the historic buildings and fish drying flake are clearly visible when on land. Battle Harbour has been restored over the years to create a unique experience for visitors to Southern Labrador who want to explore exhibits from the cod fishery days, some which date back to the 18th century. Picnic tables have been repainted and some of the buildings have been reconditioned which are now used as accommodations for guests who want a day or two adventure and tranquility at Battle Harbour. 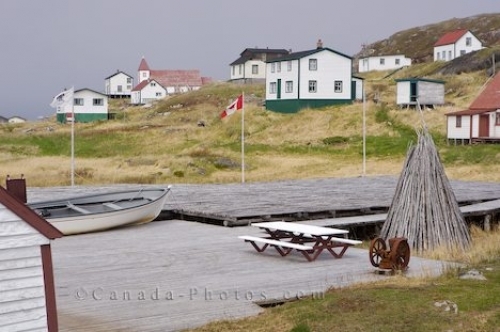 Battle Island is still home to a few local residents during the summer, but for tourists, the restored buildings, wharves, fish drying flakes, paths and boats at Battle Harbour can be explained by tour guides after disembarking the ferry which travels between Mary's Harbour and Battle Harbour in Southern Labrador. Picture of the historic buildings at Battle Harbour in Southern Labrador which was once home to a very successful cod fishery. Fish drying flake and buildings in Battle Harbour, Battle Island at the entrance to the St Lewis Inlet, Viking Trail, Trails to the Vikings, Southern Labrador, Labrador, Atlantic Canada, Canada.